Huh. Seems that my original post has disappeared into the nether regions of the interwebs. Let's try this again, shall we? 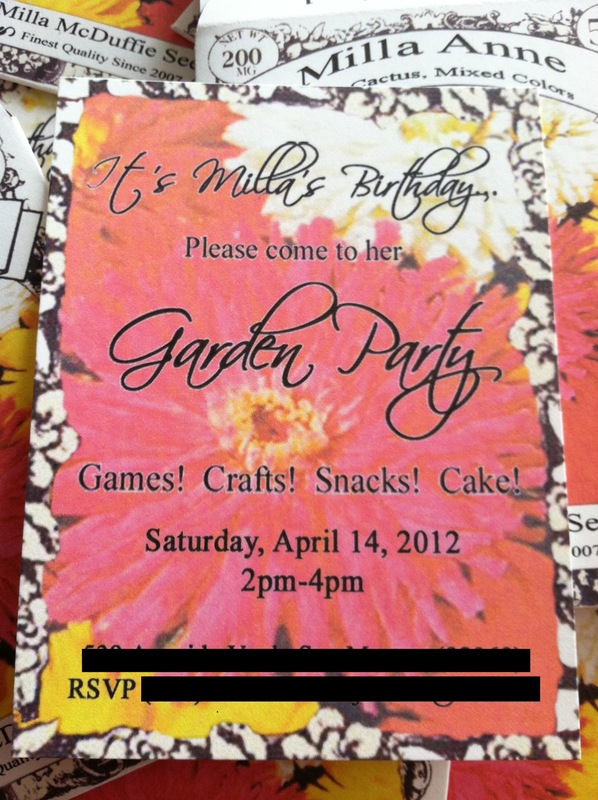 For Miss M's fantabulous Garden Birthday party, there was one very logical invitation choice. While I did find a template for seed packets online, it was really too small to work with. So, in the end, I found a seed packet I liked ("Giant Cactus, Mixed Colors" Zinnias suit Miss M hilariously well, with key words being "Cactus" -- she's a little prickly-- and "Mixed Colors" -- she's nearly always a riot of colors and stripes and plaids and animal prints and sparkly peace signs and flowers and butterflies, all in one outfit), carefully opened it up, ran it through the scanner, and Photoshopped it into what you see here. I left some of the original text, made some text more personal and enlarged it a bit. In this image, you can see the order in which the gluing happens... Glue Here on flap One, fold over Flap 2, to meet Flap one, then apply glue to Flap 3, and Fold over the Flap 2. Flap 3 IS visible on the outside of the packet, as it's the "Best Used By" date on the seed packet. For Miss M's party, I changed that Date to the actual date of the party. I'm so clevah. This image was also taken from the original seed packet, but I adjusted the transparency a little to better see the text. And that's all she wrote. The photoshopping is the most difficult part of this whole thing, but if you are at all proficient in the basics, you should be able to make this happen, no problem. Would love to see anything you guys come up with. Looks kind of complicated but reading through your step-by-step buide, I think it's all pretty handy. This is something that I can do for some bonding time with my web design cheshire team during lay hours. Cheers mate. I'd be following you from hereon.